Our videoconferencing services allow clients to communicate using high-quality audio and video signals – in real time – to locations all over the world. We can help you increase your reach by facilitating one-on-one meetings, coordinating muilt-point bridging, or broadcasting messages to people around the globe. We provide several technical options, and will work with you to find the best and most cost-effective solution for your specific needs. 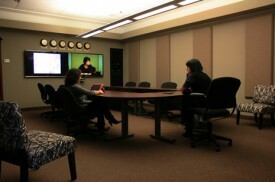 tvStudio.com offers two videoconferencing facilities in Northern New Jersey: at our Bizteque Business Center in Morristown, and at our production studio in Succasunna. Our systems also offer the benefit of portability; we can bring our technology to clients’ offices and to larger venues. This allows us to easily accommodate groups from one to 1,000 people. Our videoconferencing systems are compatible with thousands of sites worldwide and are certified by major communications networks. We have agreements with facilities across the country and around the globe, and can help facilitate your video conference down to the last detail.